Non-Repainting Indicator that sounds an alert for change in price spike in any direction on period M1 to H1. You can use this indicator on any period from M1 to H1 without the need to configure any moving average period. Spike Alert - Set alert to true if you want to be notified by MT4 platform for each ordinary price spike. Same alert function since version 1.0. Impulse Alert - Set alert to true if you want to be notified by MT4 platform for price spikes that occur 1 minute from each other. Every Price Spike - if you want to be notified for every price spike that appears, regardless of its direction. Different Price Spike - if you only want to be notified of the first price spike that has a direction different from the existing trail of price spikes. Spike Position - Plots the microtrend after n positions from the first new price spike on a different impulse direction. Micro-Trend Alert - Alerts you when a new microtrend has just been plotted. Divergence Line - Set to true if you want the Divergence Line to appear. Divergence Name - Give the name of the Divergence Line. Bullish Divergence - Color to be used for the Divergence Line when it is bullish. Bearish Divergence - Color to be used for the Divergence Line when it is bearish. Look Back Bars (Length Consideration) - Set the number of bars for looking back and counting the number of consecutive price spikes of the same colour. Look Back Bars (Immediate Bars) - Set the immediate number of bars for looking back and counting the number of consecutive price spikes of the same colour. Label Auto-Repositioning - Allow user to manually adjust the position of "Microtrend Quality" label if this is set to false. [BI][Symbol][Direction] - It is the direction of the new price spike trail. [BI][Symbol][StartPrice] - It is the starting price of the new price spike trail. [BI][Symbol][Impulse] - It is the duration in minutes between each price spike and the previous one. Wait for the adverse price spike trail to be completed, then fire a trade when you see a price spike that follows the trend. You may want to wait for the price spikes to form 3 in a row before firing a trade (using Spike Position and Spike Position Alert). If the Divergence Line is sloping at a direction different from the price spike trail or has weakening strength width, it could indicate that the price spike trail is reversing soon. If the price spikes are closer together, the micro-trend is of a higher quality to trade. You can reduce the default look back bars to less than 100 if you want to consider the "concentration of the price spikes" within a smaller time period. Please ensure that you have the ZigZag indicator, as this indicator depends on it. 1) Reduce the maximum width of Divergence Line to 5. 2) Suppressing the warning if Divergence Line has already been created when used in an expert adviser. Making finding the "Microtrend Quality" label easier when setting Label Auto-Repositioning to false. 3) Spike Position Alert is renamd to Micro-Trend Alert. Alert Messages have been improved so that it is easier to distinguish them from other alerts coming from different indicators. Included a new feature, "microtrend quality" shown at first bar. It indicates the number of consecutive price spikes of same colour within the look-back period. 1. Fixed a bug pertaining to starting price not set during first encounter. 2. Updated a better product logo. a) Bullish Microtrend - Capture number of price spikes after n position in Bullish Microtrend. b) Bearish Microtrend - Capture number of price spikes after n position in Bearish Microtrend. c) Elapsed - Capture the duration between each price spike and the previous one. 2) Original Alert as known in previous versions has now been renamed to Spike Alert. 3) Impulse Alert can now be configured to alert 1 minute price spikes. 4) Removed user inputs for Strengthening Volume, Weakening Volume widths. The divergence line will now detect the volume at each price spike and auto-adjust its width. 5) All alerts have been toggled off by default. a) Shifted the index to the right so that now the price spike is more aligned with the price in time. b) Internal angle bug computation fixed. Included Divergence Line on main chart to help to determine whether it is going to be a bullish or bearish divergence based on the relative positioning of the prices at the starting of each price spike trail. Signal generation for start of new price spike trail can now be configured. 1) Default Alert Type has been set to DifferentPriceSpike. i) SpikePos only plots the microtrend after n positions from the first new spike on a different direction. 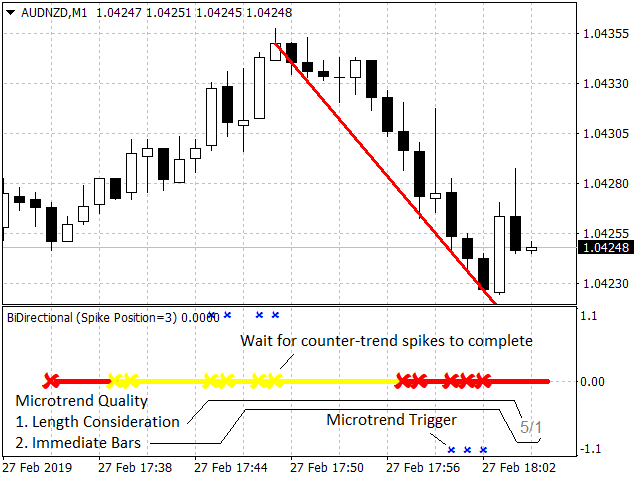 ii) SpikePosAlert alerts the user when a new microtrend has just been plotted. 3) Alert messages replace wordings from Buy to Long and from Sell to Short. A neutral line is added at the beginning when there is no price spike. It is white in color to indicate no price spikes when you first start the BiDirectional Indicator. This is a minor change. 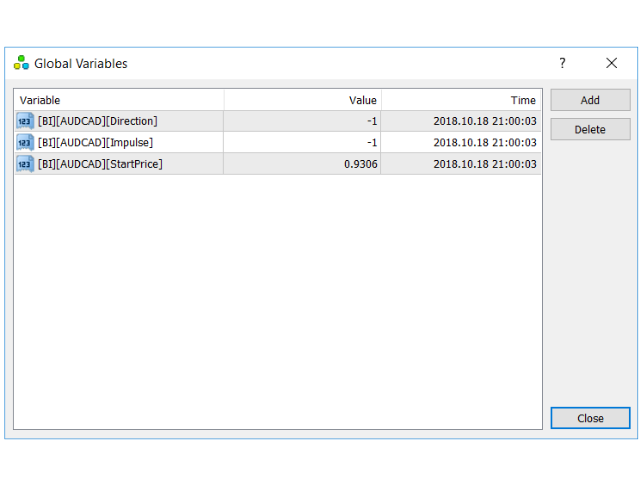 But you will need to update the index if using it as a custom indicator in an EA.